Increase your PC’s computing power with the Intel Core i3-7100 Processor. This processor with LGA1151 Interface guarantees stable connection between the processor and the motherboard. The processor speed of 3.9GHz helps you to meet your needs with great efficiency. The 3MB L3 Cache allows high performance computing for demanding applications. Intel Hyper-Threading Technology allows each processor core to work on two tasks at the same time, improving multitasking, speeding up the workflow, and accomplishing more in less time. Whether you use your PC for gaming, rendering, editing or creating, this Intel® Core™ desktop processor delivers a great PC experience. 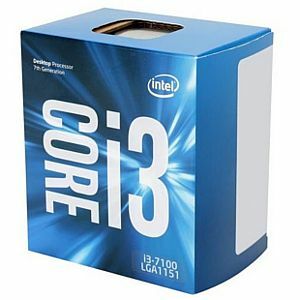 Order the Intel Core i3-7100 Processor now!